HSBC paid out $4.2bn (£2.8bn) last year to cover the cost of past wrongdoing. As well as $1.9bn in fines for money laundering, the bank also set aside another $2.3bn for mis-selling financial products in the UK. The figures came as HSBC reported rising underlying profitability and revenue in 2012, and an overall profit before tax of $20.6bn. Chief executive Stuart Gulliver's total remuneration for 2012 was some $7m, compared with $6.7m the year before. And after taking account of the deferral of pay this year and in more highly-remunerated years previously, Mr Gulliver actually received $14.1m in 2012, up from $10.6m in 2011. The company's 16 top executives received an average of $4.9m each. Globally, 204 employees were paid more than £1m last year, of which 78 were in the UK where the group has its headquarters. "HSBC made significant progress in 2012 despite a challenging operating environment characterised by low economic growth and a changing regulatory landscape," said Mr Gulliver. While acknowledging the bank's past anti-money-laundering and sanctions failings, he said the bank's performance had been strong enough to allow it to increase its dividend by 10%. HSBC was fined by US and UK regulators for breaking various laws against doing business in Syria and Iran and with Mexican drug cartels. HSBC set aside more money to cover the expected cost of past misdemeanours in the UK. It identified a further $1.7bn to cover the cost of mis-selling payment protection insurance (PPI) to mortgage borrowers, bringing the total provisioning for PPI claims to $2.4bn, as well as $598m for mis-selling interest rate swaps to small businesses. "It's beyond belief that in a year marked by dodgy dealings, 200 of HSBC's top brass are celebrating bonuses greater than many people earn in a lifetime," said David Hillman of the Robin Hood Tax campaign. "The only way to avoid the repeat spectacle of City excess is to ensure banks pay more in tax." During a conference call to present the results, Mr Gulliver told investors that the bank was not reconsidering whether to relocate its headquarters from London back to Hong Kong, in order to avoid a recently agreed worldwide cap on bonuses of all employees of banks based in the EU. HSBC's underlying profits - which ignore one-time accounting effects as well as the impact of changes in the bank's creditworthiness - rose 18%. Business rose strongly in Hong Kong and the rest of Asia, and the bank said it saw a sharp turnaround in Europe. Some 90% of the bank's earnings now come from outside the UK, while about 40% comes from the Asia-Pacific region. Meanwhile, HSBC confirmed that its staff numbers had fallen by 10% to 260,591, as it seeks to cut costs and sell off some businesses, with Mr Gulliver telling investors that the focus on costs remains "absolutely overwhelming". Its businesses in the UK and the US made losses in the year, he conceded. The US business - which took a big hit in the financial crisis from its subprime lending - has been a major focus of the bank's restructuring efforts. But HSBC's results also reflected the continuing gradual recovery of the global economy from the 2008 crisis. Loan impairments - a measure of how much money has been set aside for loans that cannot be repaid - fell by a third in 2012 to $8.3bn worldwide. The bank's results were heavily affected by a negative "fair value adjustment" to its own debt of $5.2bn in 2012, compared with a positive adjustment of $3.9bn the year before. The adjustment is an accounting requirement that takes account of the price at which HSBC could buy back its own debts from the markets. It has the perverse effect of flattering a bank's profits at a time when markets are more worried about its ability to repay its debts, and vice versa. Excluding this adjustment and various other one-off accounting effects, HSBC's bottom-line profits-before-tax fell 6% in the year. Markets were not overly impressed by the results, with analysts having expected an extra $2bn in profits. 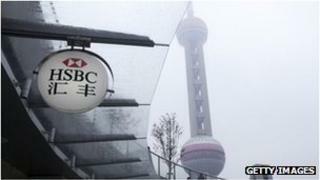 Shares in HSBC fell 2.49% in London.